The San Luis Obispo County Board of Supervisors sped through budget hearings Monday agreeing on most expenditures while having heated discussions over several proposals including Nipomo parks, road maintenance, housing and law enforcement. For more than eight months, the board has discussed and voted on funding priorities. Then, in a Tribune opinion piece on Thursday, supervisors Adam Hill and Bruce Gibson announced plans to divert $5 million from road maintenance, ground water maintenance and work force housing to nonprofit builders, such as People’s Self-Help Housing or Habitat for Humanity. 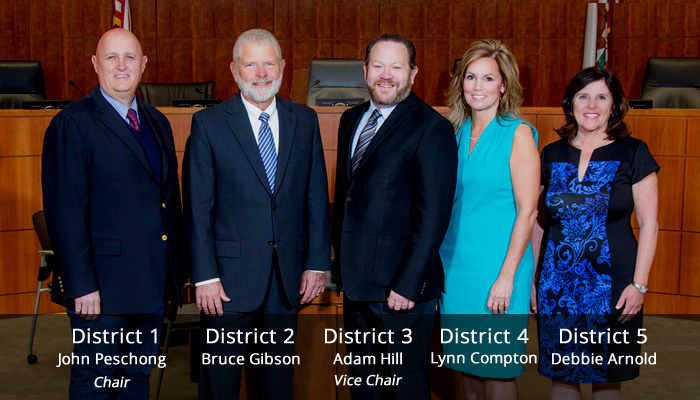 Hill and Gibson argued that their plans for low-cost housing were superior to a collaborative effort by a group of organizations including the board of supervisors, the builders association, the chamber of commerce and the Economic Vitality Corporation. Gibson also asserted that there is no demand in the county for farm-worker housing. Supervisor Lynn Compton disagreed saying there is a demand for farm worker housing and that she did not want to scrap long-standing plans for work-force housing for a last-minute proposal first written about in a Tribune opinion piece. Hill said he was appealing to Supervisor John Peschong, who Hill asserted has control over the two female board members. Hill then went on to say that people and businesses will leave the area if they do not adopt his and Gibson’s plan for low-cost housing. Peschong said that Hill and Gibson’s proposal did not sound bad, but there was not sufficient time to vet the plans. Supervisors Peschong, Compton and Debbie Arnold then rejected Hill and Gibson’s plan by a 3-2 vote. In addition to the controversy over discretionary monies, Gibson and Peschong spared over funding for two additional sheriff deputies to serve the North County. Noting both a resent shooting in San Miguel and a stabbing in Paso Robles, Peschong requested the county fund two new deputies to work in the North County where response times can run more than 45 minutes. Sheriff Ian Parkinson agreed saying he also has concerns with gang activity in the North County. Gibson argued against the expenditure because it was not listed high on Parkinson’s priority list. The board then voted 3-2 to approve the hiring of two new deputies with Hill and Gibson dissenting. In January, Compton said that more than $10 million in public facility fees generated in Nipomo had been spent in areas Gibson and Hill represent. Since then, Compton has battled with Hill and Gibson over requirements to spend public facility fees in the area where the funds were generated. Developers in San Luis Obispo County are required to pay public facility fees before they are able to receive development permits. These fees are dedicated for public facilities and parks that support the residence in the area of the development, according to county records. On Monday, Compton proposed spending $1.2 million in public facility fees on projects in Nipomo because the area is lacking in both public parks and sports fields. Gibson then accused Compton of using parks as a political ploy. “This is pure pork headed to Nipomo to bolster supervisor Compton’s bid in 2018,” Gibson said. Gibson also claimed that Nipomo has more sports fields than any other community in the county. In reality, Nipomo has only one public park with sports fields, Nipomo Community Park. In comparison, San Luis Obispo has a total of 19 public parks with 10 of those including sports fields or courts. The board then voted 3-2, with Hill and Gibson dissenting, to approve a $1.2 million expenditure of public facility fees to be used for development or maintenance of the Dana Adobe, a proposed Jack’s Helping Hands playground, pickleball courts, basketball courts, a skate park and an equestrian trail and staging area in Nipomo. Projects with high water usage were put on the back burner because of legal constraints. The budget hearings will continue on Wednesday. Compton got 1.2 million for 3 parks in Nipomo? She is ripping off the budget.Her district is in the very southern edge of the county. By far the largest number of residents within 10 miles of her district is in Santa Maria. Santa Barbara County. Money should go to districts in the middle so that residents throughout the county can benefit. How many residents from Paso, Atascadero, Cambria and Morro Bay will go to Nipomo? How many of those will go to SLO and Pismo? The majority of the board is screwing you and I. Read the county’s rules on PFF and then comment. The reason for PFF is to provide facilities such as police and fire and parks near a project. Ten million was taken from Lynn Compton’s district and spent in Adam Hill and Bruce Gibson’s districts. How does a skate park in Los Osos provide services to people in Nipomo? How does a bridge in Cayucos provide services to people in Nipomo? Instead of ignorantly repeating Hill and Gibson, do some research and become informed instead of a sheep. Gibson’s claim that Nipomo has the most parks was a blatant lie. Gibson speaks well, but is very dishonest and good at rallying his troops who blindly follow him. Very divisive at a time our country needs some unity. Yes, we know Gibson lies, such as “You promise to honor, love, and keep only to her, until death do you part”(or such), we all know he lied about that when he had an affair with his assistant, the one we as taxpayers are still paying for. Gosh, let’s make sure Cambria gets nothing as their population is smaller than Nipomo Community. Everyone is entitled to their fair share based on the philosophy of the progressive liberals on the Board, Gibson and Hill. My guess are there are more kids in Nipomo and therefore more parks and recreational facilities should be provided. It is time Nipomo and Oceano get treated as partners in this County as all the unincorporated areas pay 50% of the County Property Tax and Nipomo is just as important as Cambria! Be nice and share and share alike! What a joke. Somebody needs to investigate this so called ‘nonprofit’. The Two Stooges…Pete and Repete lose AGAIN! Oh! And John, you just keep “CONTROLLING” those girls…you are doing a superb job.